The media is doing a pretty good job of exposing how the law firm Wolff & Samson (W&S) has used its close relationships with the Christie Administration to benefit the firm’s clients and generate millions of dollars in revenues for the firm. That critical coverage has focused on W&S lawyers David Samson and Lori Grifa (repeat: we broke Grifa’s involvement in our HUD IG complaint). So, I won’t beat a dead horse here, but I do want to note a few big examples of W&S influence that have been overlooked and should be reported. So, I thought I might bullet a few more controversial DEP projects that our friends at W&S are working with the Christie Administration on. In addition to Mr. Samson and Ms. Grifa, there are other W&S lawyers that lobby on key environmental projects, specifically Dennis Toft (a heavy hitter) and John Valeri (a revolving door man). A few months ago, I wrote about Gov. Christie’s curious silence on a controversial proposal to construct an off shore LNG facility know as “Port Ambrose”, see: Why Is Gov. Christie Silent On Off Shore LNG? Gov. Christie’s silence seems inexplicable. Could it be the result of not only the national political aspirations I noted, but also the lobbying of Wolff & SAmson? W&S lawyers represent Rockland Capital – they own the BL England power plant. The recent rejection of the South Jersey Gas Co. proposed pipeline to the BL England plant was a stinging defeat for W&S and Gov. Christie, who strongly backed the project. ELEC records noted efforts to lobby DEP, the Highlands Council, and the State Agricultural Development Board regarding environmental permitting, land conveyance by the State House Commission, and related regulatory issues for power line right of way in a Wildlife Management Area, state lands, and the protected Highlands. Perhaps some enterprising journalist could file OPRA requests or make a few phone calls to find out what’s going on with those projects and permits. W&S is reported to represent WalMart. I’ve been trying to determine if that includes the proposed WalMart in Toms River. In that case, both the Corzine DEP and the Christie DEP rejected CAFRA permits for the project. But Governor Christie got personally involved in support of the project see: DEP again nixes Walmart plan, but Christie wants it approved . Subsequent to the Gov.’s personal intervention in support of the project, DEP issued a Settlement Agreement and issued permits approving the project. Was that reversal the result of W&S influence? Or just the Gov.’s arm twisting? Calling all those intrepid reporters out there working on the scandal – lots of stories here!. The New York Times ran a good story today explaining some of the history and political machinations behind the Rockefeller development project in Hoboken (see: How Pressure Mounted for Development in Hoboken). That project is the focal point in the “Hoboken shakedown”, where, according to Mayor Zimmer, carrying a message from Gov. Christie, Lt. Gov. Guadagno linked receipt of Sandy funds to local approvals of the project. Importantly, for the first time, the NY Times story brings the Department of Environmental Protection (DEP) into the scandal story. HOBOKEN, N.J. — Last May 8, a severe rainstorm left the streets of this city flooded once again, causing the mayor, Dawn Zimmer, to recall the inundation from Hurricane Sandy. So she dashed off a letter to Gov. Chris Christie, imploring him to help with Hoboken’s “ongoing flooding emergency,” and attached photos of cars in water up to their hoods. She was due to meet the next day with officials of the New Jersey Department of Environmental Protection, when she hoped to talk about protecting Hoboken from the next catastrophic deluge to come. But according to newly obtained emails sent among the participants, the first topic of discussion on the agenda was “review of concepts for flood control measures at Rockefeller property,” a reference to a billion-dollar office complex proposed at the north end of town. The developer, the Rockefeller Group, which had long been trying to gain approval from local officials, sent two executives, two lobbyists and an engineer to the meeting. Rockefeller’s proposed development is the first topic on the agenda? At a meeting that is supposed to be about the City’s “ongoing flood emergency”? Are you kidding me? The Mayor correctly refused to discuss the Rockefeller project. The next day, the Mayor got a call from Lt. Gov. Guadagno that set up the meeting in Hoboken where Mayor Zimmer said Guadagno linked Sandy aid with approval of the Rockefeller property. The agenda and timing of the DEP meeting, the Mayor’s refusal to discuss the Rockefeller project, and the Lt. Gov.’s call and subsequent visit to Hoboken are proof positive that DEP was being used by the Governor’s Office to promote the Rockefeller project. That is totally consistent with Governor Christie’s policy and Lt. Gov. Guadagno’s role as “Red Tape Czar and DEP Commissioner Martin’s shift in DEP’s mission to “promote economic development”. These kind of secret meetings between DEP political appointees and the lawyers and lobbyists for developers are improper (see: This is Why We Need Transparency At DEP). We’ve twice petitioned DEP to force disclosure of these kinds of meetings and to make the meeting calendars of high DEP officials public documents. Those petitions were denied. We did not seek to ban such meetings, just to make them transparent and force public disclosure. The public has a right to know who taxpayer funded public employees are meeting with. ELEC regulations (***see below) require that registered lobbyists disclose such meetings, so why are DEP officials not accountable? The Hoboken meeting is a perfect example of why such meetings are inappropriate, subvert the public interest, and must be made transparent. Perhaps the media will begin to focus on and report the fact that Commissioner Martin’s only qualification for the job was that he serve as an advisor to Gov. Christie’s 2009 campaign. Martin has no environmental training or government experience. He is a retired corporate consultant. It is obvious that Martin is at DEP to carry out Gov. Christie’s political agenda. I’ve been urging the press corps to investigate the DEP role in the various scandals that are exploding in the wake of Bridgegate and Hoboken, as investigative reporters finally begin looking at how the Christie administration operates. Let’s hope that today’s story opens the flood gates for a series of stories of how DEP has used its regulatory powers to promote the economic interests of friends of Governor Christie. There are many shoes to drop in that line of inquiry. Here is Lori Grifa’s, (Wolff & Samson) 2nd Quarter 2013 (April – June) ELEC Report: Note representation of Rockefeller Group before NJ Transit and NJ DEP on Hoboken issues. Will Next $1.46 Billion In Federal Sandy Money Lead to More Fiasco’s Like HGI Termination? HOW WILL STATE SPEND NEXT BATCH OF FEDERAL FUNDING FOR SANDY RECOVERY? Not only is the NJ Spotlight story far too little and far too late, it pulls punches and actively whitewashes – not just simply ignores – the recent scandal surrounding the termination of the Sandy aid contract with HGI. HGI was NJ’s largest Sandy aid distributor (for details of that story, see this). Once again, we were months out in front of that HGI story and right on the money too (i.e. see this October 2013 post: Did Christie Select Another Corporate Crony For Sandy Recovery?). Today’s Spotlight story didn’t just miss the real story and omit critical information (see my below comment on it). Spotlight coverage actively whitewashed the mismanagement and bad faith efforts by the Christie Administration, specifically including Sandy Czar Ferzan and DCA Commissioner Constable, who failed to disclose that contract termination to Legislative oversight Committee and the media. And this is not just me speaking – compare the Star Ledger editorial Board’s scathing criticism, with how Scott Gurian at NJ Spotlight covered the issue. Just two days later, Richard Constable, who oversees the state’s rebuilding programs, testified for the first time before the state Assembly. He’s in charge of these grant programs that HGI was screwing up. Did he not think it necessary to mention this firing when he defended the administration against its critics? Constable didn’t disclose it last week, either, when he cited new signs of progressin the state’s relief efforts, including more grants finally being doled out, and letters sent to applicants on the waiting list to let them know where they stand. Could this be because the state is now trying to remedy HGI’s mistakes? Marc Ferzan, the so-called Sandy czar, also didn’t bother to share the news in his phone conversation with reporters just three days ago. He had briefly poked his head out of his hole to defend his boss, Gov. Chris Christie, against accusations of political threats in Hoboken. Speaking in a hearing before lawmakers a few weeks ago, DCA Commissioner Richard Constable said his department anticipates releasing a draft of its plan by the end of this month. The public will then have a chance comment on it before a final version is officially adopted and submitted for federal review. There are a few key differences, however, between the process this time and the process that culminated in the state’s original action plan for the first $1.8 billion in funding. Gurian actually makes it appear that Constable is enhancing transparency and public participation, not covering up mismanagement and shutting out the public from Sandy funding decisions. But its not just these political and management controversies that get short shrift. It would have been far better if media coverage and coastal advocates began making demands about the substance of the new HUD rules and NJ’s failure to comply with them 2 months ago, rather than now, just days before the release of the Christie plan, which effectively is a fait accompli. But even still, we’re glad that this issue finally is getting some attention. The new HUD requirements involve science, policy change, planning and public outreach. Unfortunately for NJ Spotlight readers and the people of NJ, that too was ignored. It really is amazing that our work gets relegated to the comment section, particularly when the media content and the coastal advocacy work is sub-optimal. BTW, as I’ve recently advised some of the sources in the Spotlight story, a 30 day written comment period is totally inadequate. HUD rules require a “transparent and inclusive process” and a “science-based risk analysis” addressing sea level rise and other effects of climate change. President Obama’s Climate Action Plan is the policy framework within which HUD will apply these requirements. So, a 30 day comment period on a draft plan already developed is sham. We must demand that the Christie Administration conduct a real planning process, so the the public and competent scientists and planners are involved in developing the plan. Just look at the termination of the HGI contract for failure to distribute the RREM funds as an example of what poor planning, no public outreach, and flawed program development cost. Former State Department of Environmental Protection official and activist Bob Wolfe (sic) says Samson was likely instrumental in getting the proposal in front of the Pinelands Commission. Mr. Samson is personally and deeply involved in both Bridgegate and the Hoboken Shakedown scandals. Both events are under at least 6 federal and state criminal, legislative, and administrative investigations. … we are concerned that the reviews taking place under state authority may be compromised by politics. According to the New Jersey Comptroller’s website, the law firm of Wolff & Samson has been selected as a contractor to conduct various auditing and program oversight functions. One of the named partners of that firm, David Samson, served as Gov. Christie’s campaign counsel and as the head of his gubernatorial transition. In addition, Mr. Samson is Gov. Christie’s appointee to the Board of Commissioners of the Port Authority of New York and New Jersey. Moreover, the principal in Samson’s firm overseeing audit management of the state Department of Community Affairs is Lori Grifa, Christie’s director of that same agency from 2010 to 2012. The political connections and revolving door dynamics raise issues of the independence and objectivity of state contract auditors. These dynamics further argue for the need of a thorough independent audit of these expenditures. 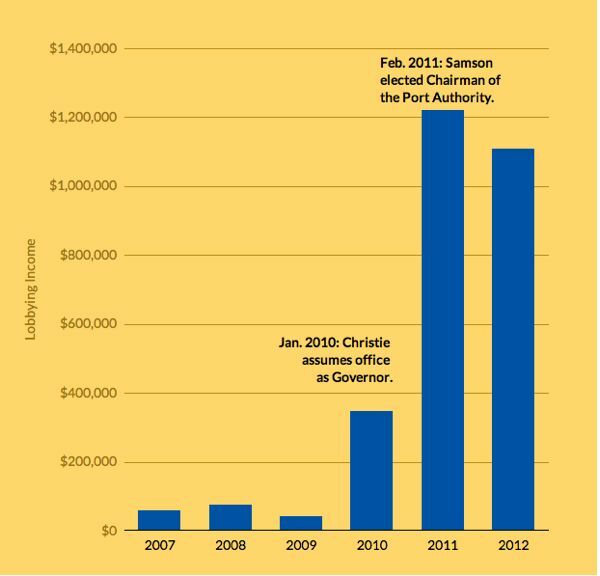 Records also show that Wolff & Samson’s municipal bond counsel business has quadrupled during Christie’s tenure. During the previous administration of Gov. Jon Corzine, the firm handled $2.4 billion worth of bond sales. In Christie’s first term, just concluded, that jumped to $10.1 billion, according to data provided to WNYC by Thomson Reuters, a media and information company that tracks the municipal bond market. Wow! Not bad work if you can get it! Governor Christie has no problem with any of this – at his two hour press conference on Bridgegate (before the Hoboken disclosures), he said he met for two hours with and strongly supported “General” Samson. So, if Gov. Christie is too ethically challenge to even see a problem, we look forward to, at a minimum, the resignation of Chairman Samson. More shoes to drop as more stories emerge on Samson’s clients that got favorable treatment by the Christie Administration. Interestingly, for the first time, DEP is brought into the scandal. There is PLENTY of low hanging fruit in DEP – just look at Wolff & Samson clients and how they got special treatment in permit, enforcement and various DEP cleanup approvals. [Update #2 – 1/30/14 – Bergen Record reports: Proposed N.J. bill would require Port Authority panel to examine ethical issues – Gov. Christie vetoed the bill last year. A quick note on the firing of Christie Administration’s main contractor for distributing Sandy aid. Readers can take the short cut and read today’s Star Ledger editorial. First, we are not Christie scandal mongers – we’ve long been critical of the Christie Sandy preparation and recovery effort and were specifically disappointed in the failure of the NJ press corps to write the HGI story, which was broken by the Wall Street Journal (see: Did Christie Select Another Corporate Crony For Sandy Recovery? The reconstruction program has received 12,254 applications, and 3,497 have been deemed eligible, the state records show. No grants have been awarded yet. Contractors are still collecting documentation from homeowners and conducting property inspections—a time-consuming process, state officials said. But, we’re glad to see that the Star Ledger editorial board now realizes that they were wrong to blame [public sector] “bureaucrats” for the failures in distribution of Sandy aid money. The [private sector] contractor and the Gov.’s failed management were to blame. But they should apologize for that smear (see: Don’t Blame the Bureaucrats – Blame the Governor and the Media). So, we’d like to offer a few thoughts on why the Christie Administration chose to keep this contract termination quiet. 2) it would reinforce corruption themes now emerging in the various scandals, specifically, HGI was a a political donor to Gov. Christie and the Republican Governor’s Association. Like Ashbritt , there may also have been connections with Haley Barbour. Already gravely wounded by multiple scandals, the Christie people knew that those facts would set off another round of media feeding frenzy, so tried to sweep it under the rug. 3) HGI got paid $10.5 million for their failure – that’s sure to outrage a LOT of people, especially those still waiting for Sandy money. 4) The HGI failures would shed light on the Christie Adminsitration’s failure to comply with new HUD rules, which mandate that NJ conduct “transparent and inclusive process” to develop Sandy recovery funding plans, including “science-based risk analysis” addressing sea level rise and other effects of climate change.